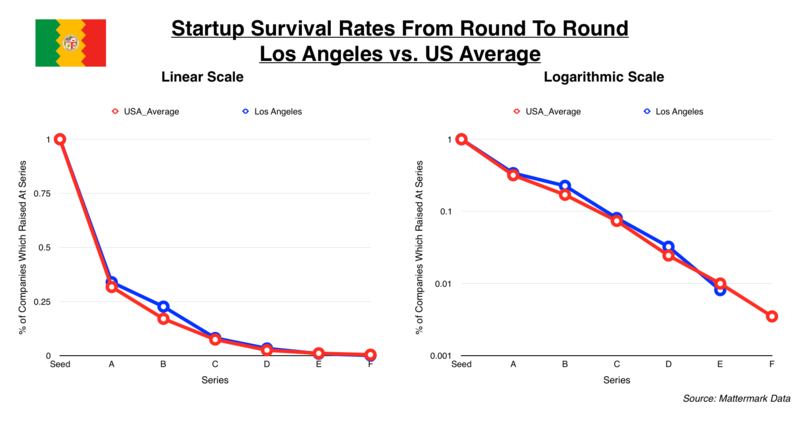 tl;dr: We find out where your startup is most likely to survive from round to round. In breaking news, it turns out there is more than one city in the United States. This week, we’re asking the same question, but with a bit of a twist. Which of America’s top startup hubs have the highest rates of startup survival on a round-by-round basis? In other words, if, in general, the life of a startup (at least with respect to fundraising) is poor, nasty, brutish, and short, where in particular is it less so? 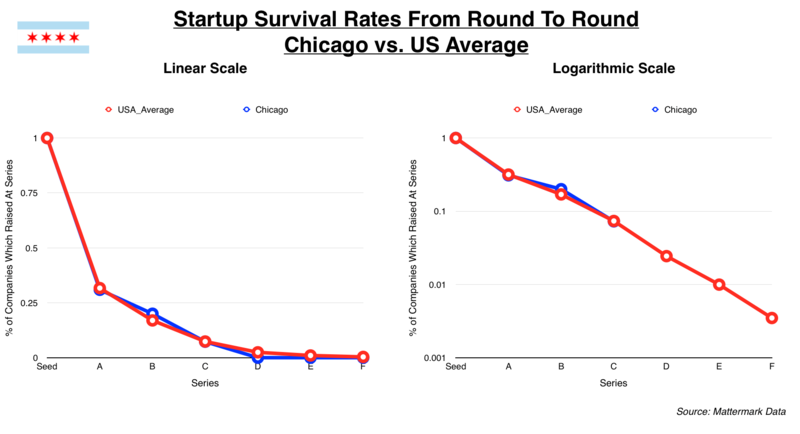 Here, we’ll take the six most-represented metropolitan regions from our original set of 2,011 companies and compare their survival rates against the average.1 In rank order, here are the regions: the San Francisco Bay Area, New York City, Boston, Los Angeles, Seattle, and Chicago. We’ll take a look at each city’s performance, tie our findings here back to previous coverage of cities we’ve done on Mattermark, and try to figure out what all of this means for entrepreneurs, investors, and civic leaders. In previous articles on Mattermark, we’ve established that places like San Francisco, New York City, and Boston dominate America’s startup ecosystem. In terms of funding event frequency and dollar volumes, inbound mergers and acquisitions activity, and other factors, these hubs stand head and shoulders above the rest. But what about in terms of round-to-round survival of the startups based in these mega-hubs? Let’s find out. Here’s how to read the charts below. Both charts on the left and right display the same data, but use different scales. The red line shows the survival rate of all 2,011 companies in our dataset, whereas the blue line shows the survival rates of just the companies from a particular city. 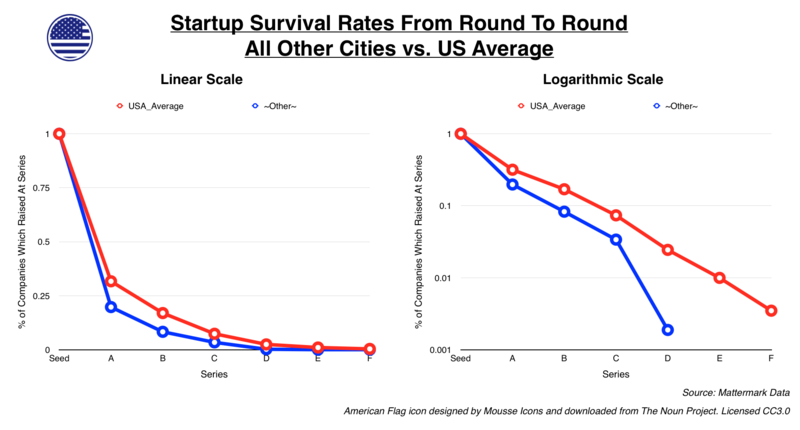 Wherever the blue line is below the red line, that means the city’s startup survival rate is below the national average. 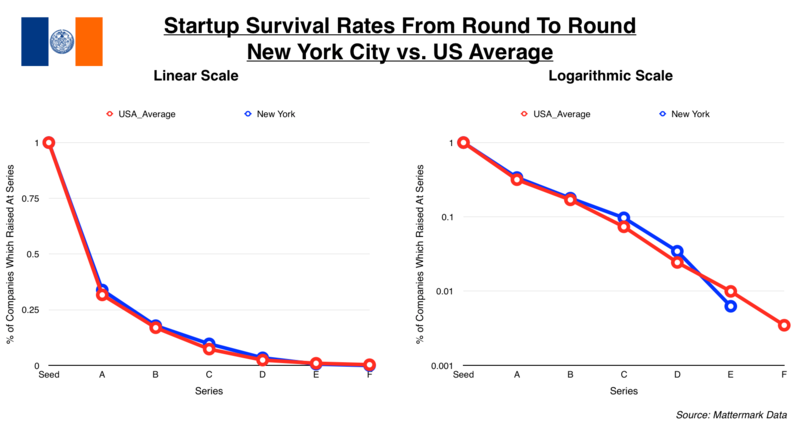 In both New York and San Francisco, the round-to-round survival rate is higher than the national average across all rounds, whereas Boston lags behind the average in earlier stages of the fundraising lifecycle but comes out ahead in rounds following Series C.
What about the slightly smaller startup hubs? Los Angeles and Chicago are at or near the national average across all rounds, faring slightly better in certain places. 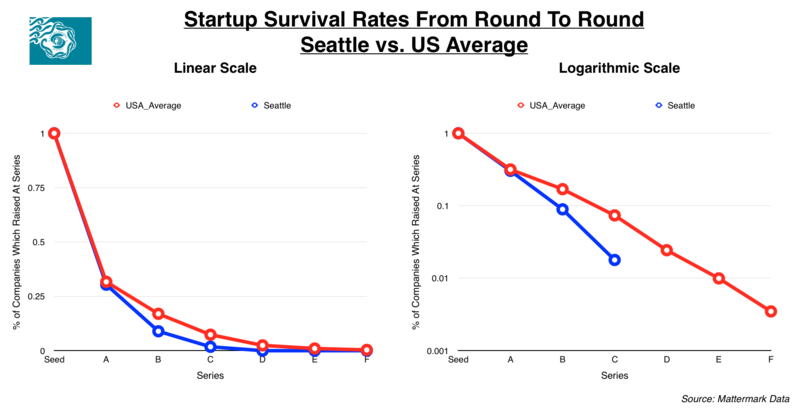 The real surprise here is Seattle startups, the round-by-round survival rate of which falls precipitously relative to the national average. Additionally, Chicago and Seattle are the only major startup hubs where companies that raised their seed rounds between 2009 and 2012 didn’t raise beyond Series C in our dataset. What about the rest of the country? There are plenty of smaller (but still vibrant) startup hubs like Austin, Boulder, and Washington D.C., as well as cities like New Orleans that produced only a couple seed funded startups that, taken individually, didn’t have enough data to make any general claims about their performance. Taken together, these 34 metropolitan regions (plus the cities that weren’t associated with a metropolitan region in our dataset) account for roughly 25% of the startups that received seed funding between 2009 and 2012. It’s easy to see that, in aggregate, these smaller startup cities significantly underperform both the largest startup hubs and the national average. The company reaches financial sustainability. We might expect a lack of adequate venture capital funding, access to markets, and other factors to be the primary cause of the drop-off in cities with smaller startup ecosystems (i.e. the ones aggregated in the final chart). M&A activity may help explain why startups in a city like Seattle don’t raise beyond Series C. And reaching financial sustainability likely accounts for some of the drop-off in places like Chicago, where startup investors are thought to be more conservative and focused on underlying business fundamentals. Alternately, from a probabilistic perspective, smaller hubs don’t produce enough startups to have one make it beyond Series C (or whichever arbitrary milestone you wish to set). This all makes a case for why startups fail to make it to the next funding round, but, frustratingly, it doesn’t make a positive case for why some cities outperform the average. More than anything else, our analysis demonstrates the value of strong, established startup communities. The key word is likely “established.” In his book on the subject, Brad Feld (who, full disclosure, is an investor in Mattermark and sits on the company’s board of directors) explains the pillars of a strong startup ecosystem. Chief among them is the notion that a startup ecosystem must be led by entrepreneurs who have an interest in staying put. 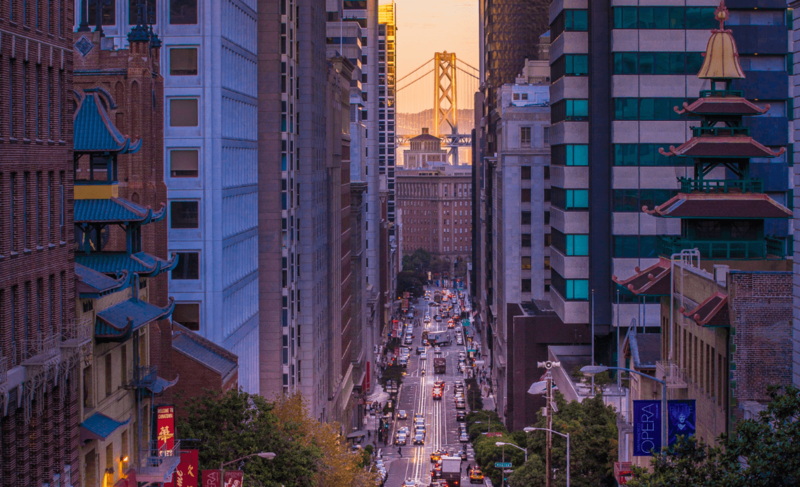 The Bay Area has been a major hub of startup activity for decades at this point. It has produced several generations of entrepreneurs, many of whom stay and give back through investing, community organizing, and mentorship of young up-starts. It might be the depth and breadth of its alumni network that leads Bay Area startups to survive at a higher rate, at all stages, than startups in the rest of the country. 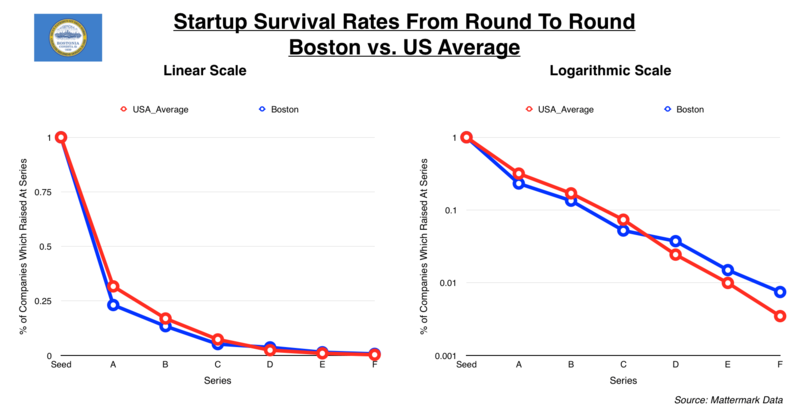 But, then again, Boston and New York’s startup communities have been around for awhile too, and yet survival rates in these cities aren’t markedly better than the nation as a whole. In all likelihood, there are a number of interlocking factors that contribute to high rates of startup survival, but disentangling all of them is a gordian problem we can’t solve here. And all of this is complicated by the fact that each hub is unique. It’s the inverse of the old Tolstoy quote, which I’ll proceed to butcher here. 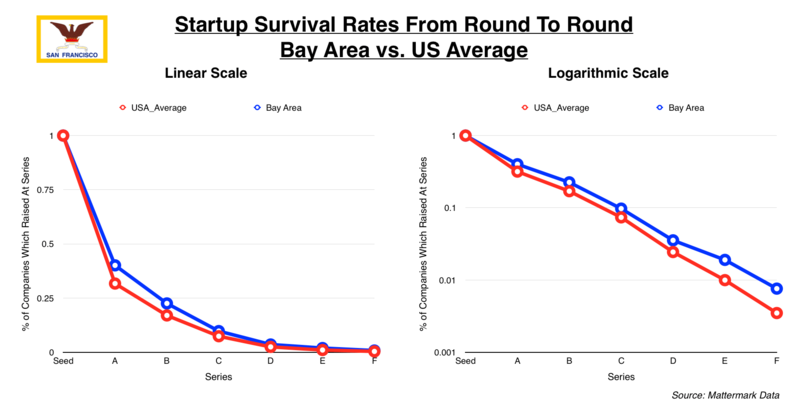 All startup hubs with below-average rates of round-to-round survival are the same. Each hub that rises above the average likely does so in its own way. We found this by looking at the fundraising trajectories of 2,011 companies that raised seed rounds between January 1, 2009, and December 31, 2012, inclusive. It’s sufficiently recent to include companies like Uber and AirBNB, which both raised their seed rounds in 2009, and Snap Inc. (née Snapchat), which raised its seed round in 2012. Enough time has passed since then to see some companies to progress through multiple late-stage rounds.